Ever since my teenage years (a long time ago!) I have been intrigued by the peculiar ambience and sweet tonal quality of the Pathé Hill-and-Dale-cut records; also by the bizarre methods of recording and the unusual, interesting catalogue of selections and of the performers found on these records. Pathé Frères Phonograph Co. had its beginnings in France and rapidly became the predominant phonograph and record manufacturer in that country. They soon established branches and recording studios in several countries around the globe, and recorded many notable singers from the "Golden Age of Opera" on their own home turf, some of whom never recorded for any other companies. Pathé’s recording process, up until the time when the company finally gave in and adopted the lateral needle-type process (Pathé Actuelle), was to record onto huge master blank wax cylinders. From these, sub-masters, in either cylinder or disc format, rim-start or centre-start, could be made using a pantographic process developed by the Pathé brothers. Not only that, but recording speeds could be varied in order to fit any given master onto the various disc diameters or cylinder lengths. For example, in my collection I have 2 sets of pantographic copies of the identical performance of Tchaikowsky’s 5th Symphony on 14" discs. One set is centre-start and both discs play at about 92 RPM, while the other set is a paper-label edge-start version, one disc playing at 80 RPM and the other at 60 RPM! Stylus swings in an arc which closely intersects with the turntable spindle, reducing tracking error. The earliest Pathé discs, around 1907, were centre-start, and speeds anywhere up to 130 RPM were the norm. The large diameter sapphire ball stylus, like the ball stylus found on Edison Automatic reproducers, tends to muddy high frequency sounds at slow surface speeds, hence the need for high RPMs. Although French perversity might explain starting at the label, the reason undoubtedly was to reduce the effects of inner-groove distortion. The sound fidelity would constantly improve as the stylus moved outward and, as the climax of most vocal pieces tends to be towards the end, the listener would be suitably and increasingly impressed by the clarity. By late 1914, U.S. Pathé began issuing paper-label edge-start records and by late 1915 the entire U.S. catalogue had been re-mastered accordingly. Also, speeds gradually became standardized at approx 80 RPM, but this speed can be used only as a rule-of-thumb. Often the 2 sides of a Pathé disc, issued even as late at 1921, can be recorded at different speeds. In my experience, it is essential to do at least a rough speed check on any Pathé disc to get the most enjoyment out of it. If you know what key the piece is in, for example Chopin’s Nocturne in E flat (Eb), you can easily check the pitch by playing Eb on the piano and adjusting the speed control accordingly. However, the vast majority of titles give no indication of key, and here you’re on your own. If it’s a vocal recording and you are familiar with the timbre of the artist’s voice, adjust the speed control until it sounds "right". Then go to the piano and see if the pitch is right on or is "in the cracks" between the keys. If so, correct up or down until it matches the piano note. And remember that most pieces are played in simple keys, without too many sharps or flats, for example; C, D, G, E, A, F, Bb, Eb, etc. Chances are the record was recorded in one of these keys. This procedure seems to work pretty well for the majority of Pathé discs. Exploded view of the adapter. Today, unless one has a suitable gramophone with variable speed control and vertical-cut capability (along with a proper Pathé sapphire ball stylus) it is not possible to play these unusual records. Of course, there exists modern specialist equipment used by archives and high-end collectors to reproduce Pathés electronically, but I have never felt that playing them "modern" is quite kosher. I can hear that the immediacy and the living-breathing presence of the original performance is somehow lost. 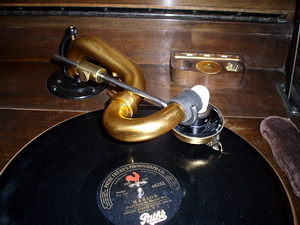 One of the difficulties that one soon encounters when playing Pathé or other sapphire records on conventional gramophones with proper attachments, and even on Pathé machines equipped with proper Pathé sound-boxes, is fairly rapid record wear, even with a perfect ball stylus. This wear is caused by a number of factors, but mainly by the heavy weight of reproducers, coupled with the inability of the stylus to properly track the vertical undulation due to the relative inflexibility of the diaphragm and excessive mass of the stylus bar assembly. Coming from a musical family, and having spent much of my spare time trying to get the best possible sound out of early records on original acoustic machines, I eventually came to the conclusion that, if I could figure out the logistics of playing Pathé discs on an Orthophonic Victrola, the enormous re-entrant exponential horn in one of these machines would reproduce an expanded range of tonal frequencies, particularly towards the bass end, and possibly reduce the high frequency noise and scratch. But perhaps even more important might be the superior range of flexibility of the Victor Orthophonic stylus bar assembly in reducing record wear. 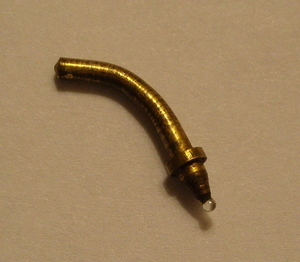 Brass shank Pathé stylus showing the 50 degree bend. The Orthophonic sound-boxes were, I feel, unjustly maligned by Read & Welch in their book "From Tinfoil to Stereo" as being very damaging to Orthophonic recordings largely due to their weight. However, my experience with properly functioning Orthophonic sound-boxes is quite the opposite. Records may be played many times over with loud-tone needles without exhibiting the slightest evidence of wear and, in addition to this, steel needles which would normally show serious signs of wear after one or two plays when used in a typical gramophone sound-box of the teens or early 20s, last up to 10 to 15 times longer in an Orthophonic box. It has to do with the flexibility of the whole stylus assembly. This leads to the conclusion that stylus bar and diaphragm flexibility is by far the most important factor in obtaining optimum reproduction with minimal stylus and record wear. In my estimation, the Victor Orthophonic technology is light-years beyond all others in this regard, possible exceptions being the Edison Diamond reproducers. 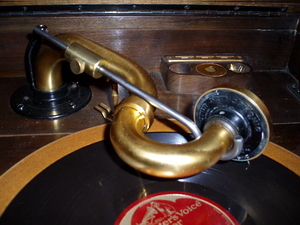 About 6 years ago, I began a series of experiments on my 1928 Orthophonic Credenza Victrola to see if it would be possible to make a suitable adapter to permit the playing of vertical-cut Pathé discs. As my Credenza is in near-mint condition, whatever changes required were going to have to be easily reversible, and nothing must distract in any way from maintaining the absolute originality of the machine. As can be seen in the photos accompanying this article, the solution turned out to be not only simple and inexpensive, but it satisfied one of the basic rules of turntable geometry, i.e. that the sapphire ball should swing in an arc which would intersect as closely as possible with the centre of the turntable spindle to reduce tracking error. Elimination of tracking error is of utmost importance on shallow-groove Pathés. 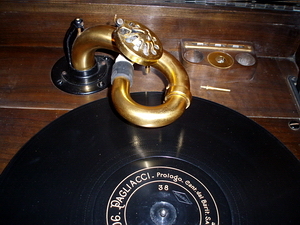 Best of all, no modifications affecting the authenticity of the Victrola are required, and switching back and forth from lateral-cut to vertical-cut position can be done very quickly. Playing a rim-start Pathé record with the optional counterweight. There are only 2 parts needed: a 1/2 inch CPVC plastic pipe elbow available from your local hardware store for less than one dollar and a 1- inch length of flexible rubber tubing of the kind used to connect Edison cylinder cygnet horns to their reproducers. Various types of this tubing exist. 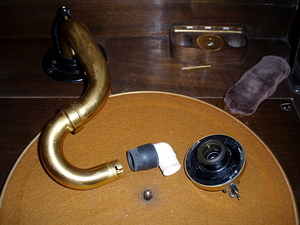 The important thing to look for is that the rubber must not be too rigid and that it should stretch enough to fit snugly over the crook in the tone arm and onto one end of the plastic pipe elbow. Next, modify the plastic pipe elbow by machining one end only in a lathe to an outside diameter of about 0.778". The idea here is that it must be a snug friction fit inside the snout on the back of the Orthophonic sound-box, so you must have your sound-box handy by the lathe to do the final fitting by trial and error. When it is correct, the elbow can be readily inserted into the snout, but it has to be a tight fit. After all, it’s friction that holds it together, and I shudder to think what might happen if the sound-box fell off in the middle of one of your favourite records! Moreover, you do not want to have any air leaks. 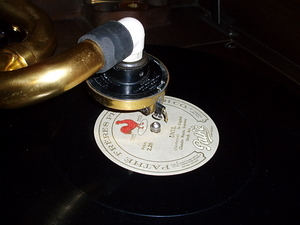 The adjustable counterweight may also be used to advantage when playing standard lateral-cut 78’s. This is the really scary part! You must put a 50 degree bend in the shank of a standard straight-shank Pathé stylus. The brass shank is relatively malleable and easy to bend, but take particular care to avoid damaging the sapphire ball. Note particularly that the bend should not be too sharp (see photo) and that the part that inserts into the stylus bar should enter no further than is required to be clamped by the thumb-screw. This is because you will need as much shank length as you can possibly get visible outside the stylus bar in order to achieve sufficient clearance between the thumb-screw and the record in playing position. Do not attempt to bend the Pathé stylus while it’s mounted in the Orthophonic sound-box or you’ll destroy the reproducer. Do the bending in a machinist’s bench vise with a pair of needle-nose pliers. Remember that most, if not all, Orthophonics have pot metal taper-tube support brackets. These tend to crystallize with age and exposure to environmental moisture and they become weak and easily broken if subjected to undue force. Shove the rubber hose about 1/2 inch onto the un-machined end of the CPVC plastic elbow, then shove the other end of the hose onto the crook with a twisting motion, until the end of the elbow touches the crook, elbow facing downward (see photo). Carefully support the crook and taper-tube with your left hand while doing this to avoid unnecessary force on the support bracket. Playing a 14 inch centre-start record with the trip post removed and fork out of the way. Next, insert the sound-box onto the machined end of the plastic elbow. Note the general angles of the parts as shown in the photos. Finally, install the stylus and clamp it in place. Before attempting to play a record, be sure that the needle thumb-screw does not contact the record. If it does, revolve the rubber hose slightly on the crook until there is at least 1/64" clearance when the sapphire is resting on the record. If you would like to further reduce record wear and stylus pressure, it’s well worth the effort to make a simple counterweight. Form a suitable hook on one end of a 9" length of ordinary 1/4 inch steel or brass rod. Next drill a 17/64" hole down through the centre of a 1 1/2"” long 3/4"” brass rod. Drill and tap a suitable hole in from one side of the brass rod for some kind of thumb-screw to hold the weight affixed to the rod. The weight may be moved one way or the other along the rod to vary stylus pressure on the record. This counterweight arrangement can also be used to advantage when playing standard lateral-cut discs. The automatic shut-off mechanism needs to be "nobbled" so that it does not function. Simply disengage the fork from the trip post which projects underneath the taper-tube arm, and move the fork out of the way. Playing 14 inch centre-start discs, the reproducer may be flipped back in the normal way for changing records. Note that the trip post has been removed. But don’t close the lid! The trip post must be removed entirely. Loosen the hex nut with a tiny wrench and then the trip post may be unscrewed. It will probably be necessary to loosen the 4 hold-down screws on the taper-tube support in order to raise the arm sufficiently to get the trip post completely out. 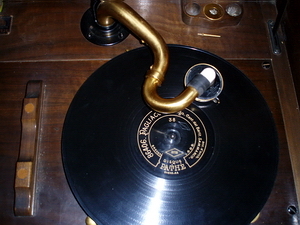 The best sound reproduction can be obtained from an Orthophonic Victrola only when the lid is closed when playing. Leaving it open creates phase distortion due to the long exponential horn, and you also get more surface noise along with annoying buzzing and mechanical noises. If you are playing hill-and-dale discs without the counterweight, you can swing the reproducer back in the normal way for changing records. But DON’T ATTEMPT TO CLOSE THE LID when the reproducer is in this position! If you do, you’ll permanently destroy the reproducer! (Another good reason for using the counterweight is that you can’t flip the reproducer back when using it.) I suggest resting the reproducer on a soft pad, such as a record brush beside the turntable, while changing records or for closing the lid. In general I am very pleased with the results of this easily reversible adaptation. Not only is record wear reduced, especially with the counterweight, but there is a more even frequency response than with Pathé reproducers. Bass frequencies are considerably enhanced but not the treble. 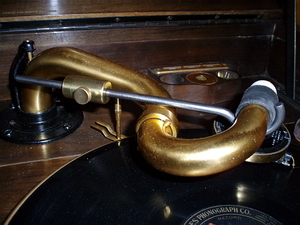 (Treble frequencies are reduced by a lot of curves and bends in the tone arm and horn system in the Victor design.) Voices reproduce more naturally, and individual tonal characteristics of musical instruments sound more realistic. Recording studio acoustic is more apparent, sometimes to the point where unwanted machinery noises, crashing music stands and other blunders can be distinctly heard! But best of all is the enhanced presence and clarity of sound, particularly on records that were well-recorded originally. So all things considered, the experiment has been a great success, and has brought me increased enjoyment of my Pathé records.